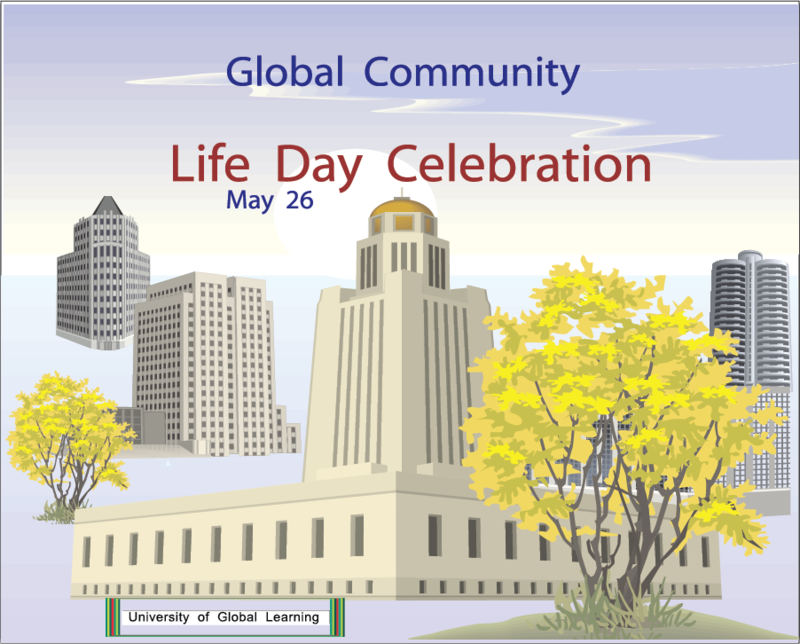 Images shown in the animation. Soul of all Life said in Global Peace Earth "Soul of all Life teaching about Peace: Introduction" Peace is being who you are without fear. It is the "being who you are" who must be taught a value based on principles to live by. 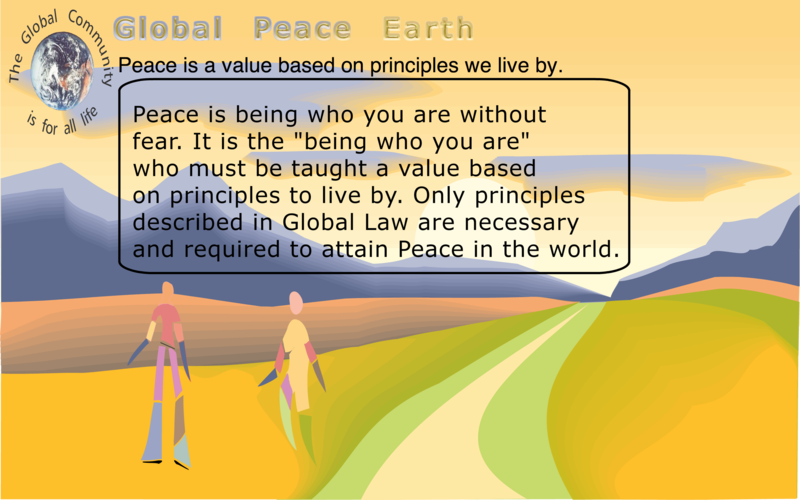 Only principles described in Global Law are necessary and required to attain Peace in the world. 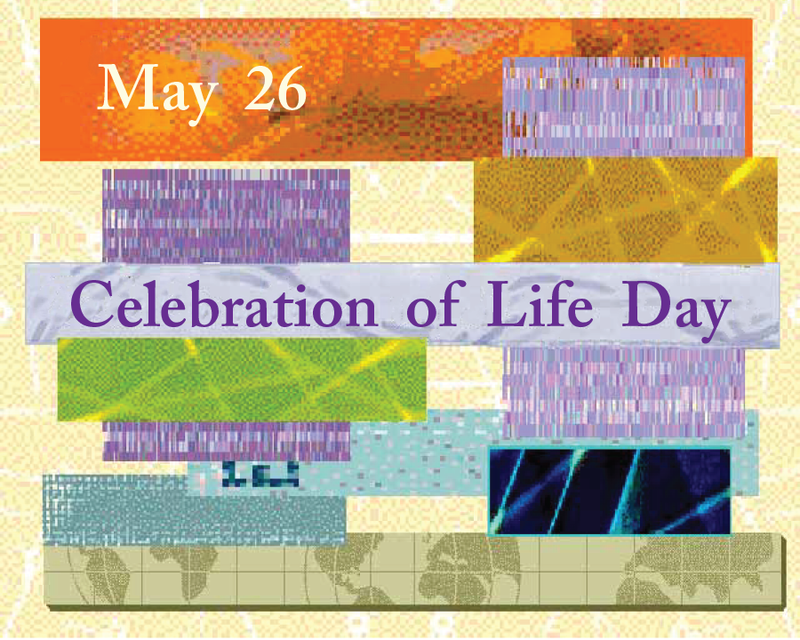 On May 26, as part of the Peace Movement of the Global Community, the Human Family, global citizens were rejoicing with all Peoples of the world , and all life, for the annual Celebration of Life Day. 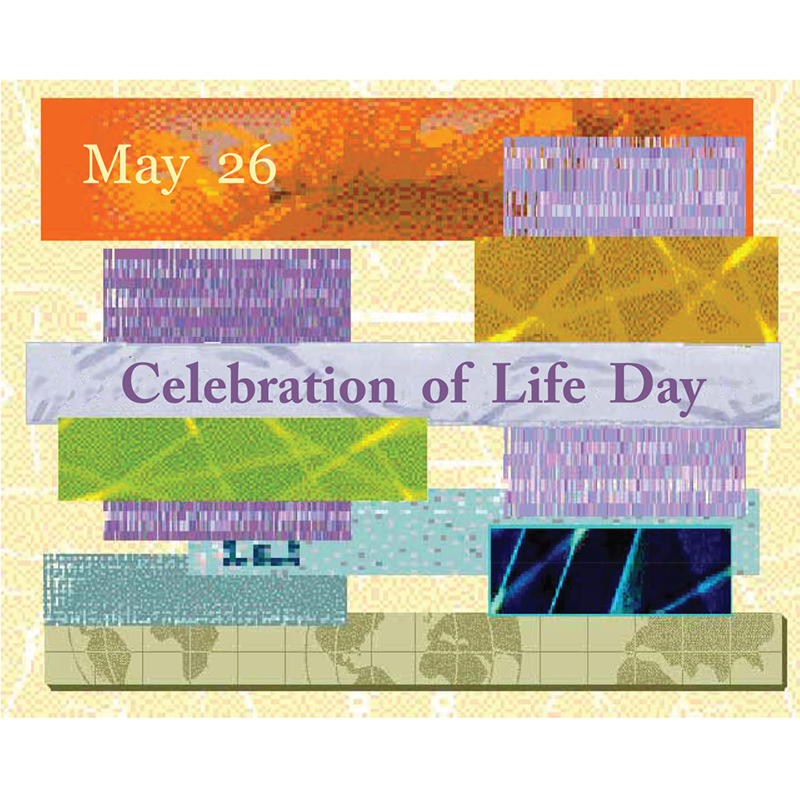 Life is the most precious gift ever given by God to the universe and this event needs to be celebrated. At the early stage of the formation of the Earth, and a while later, all the conditions for the formation of life were present, and life was created to better serve God. Life was made of matter and every particle of that matter had a Soul that merged with all the others. 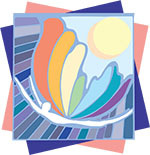 A Soul is a part of the Spirit of God, His or Her consciousness, and is a living, loving presence, a Being. A Soul can merge with other Souls and become one Soul, and it can evolve as well. The first spark of life was the cause for the formation of a unique and independent Soul to better serve God. Throughout the different evolutionary stages of life on Earth, Souls have guided the step-by-step evolution of life and kept merging with one another to better serve God. They guided the evolutionary process in small, incremental ways over a period of several billion years. Many groupings of Souls became more complex than others as they were much brighter beings than other groupings, but all serve God in their own special way. Global rights and the taxation of natural resources can each be used to create and protect this biodiversity zone in Nunavut and over the entire North Pole region. The Inuit government and the Canadian government are invited to start the process of creating such zone. The Global Community has set aside a specific region to create and protect a biodiversity zone in the North Pole region. 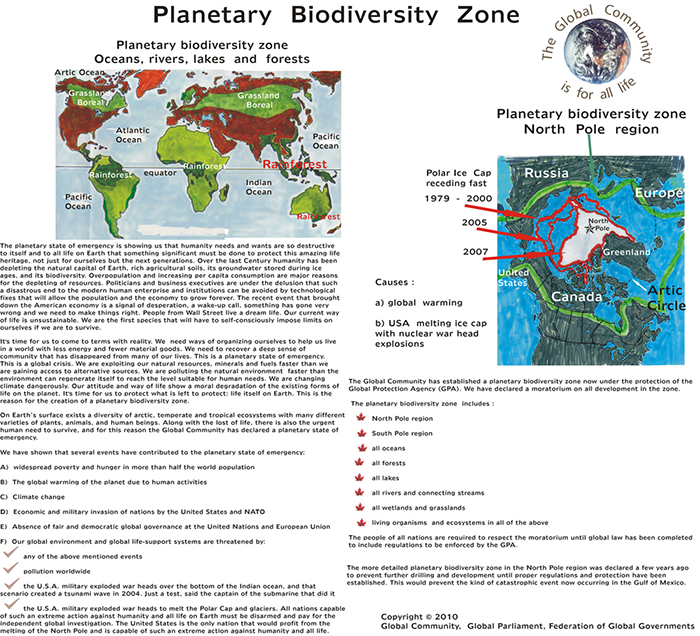 The Global Community has also established a planetary biodiversity zone now under the protection of the Global Protection Agency (GPA). We have declared a moratorium on all development in the zone. The people of all nations are required to respect the moratorium. 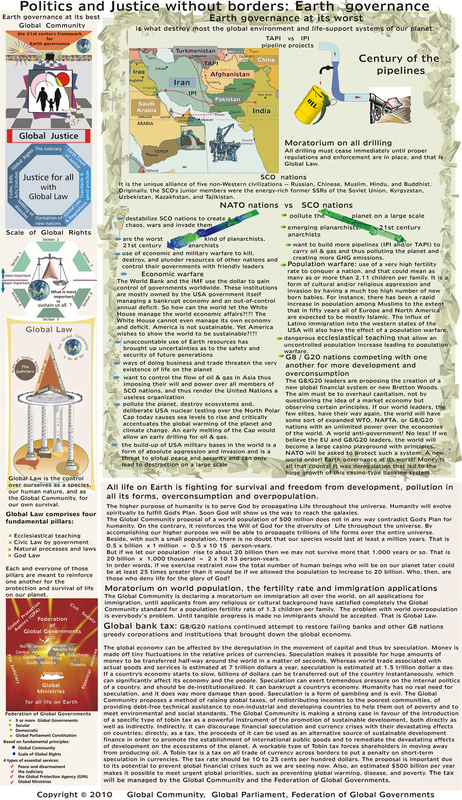 On Earth’s surface exists a diversity of arctic, temperate and tropical ecosystems with many different varieties of plants, animals, and human beings, all of which are dependent on soils, waters and local climates. Thus biodiversity, the diversity of organisms, depends on maintenance of ecodiversity, the diversity of ecosystems. Cultural diversity – which in effect is a form of biodiversity – is the historical result of humans fitting their activities, thoughts and language to specific geographic ecosystems. 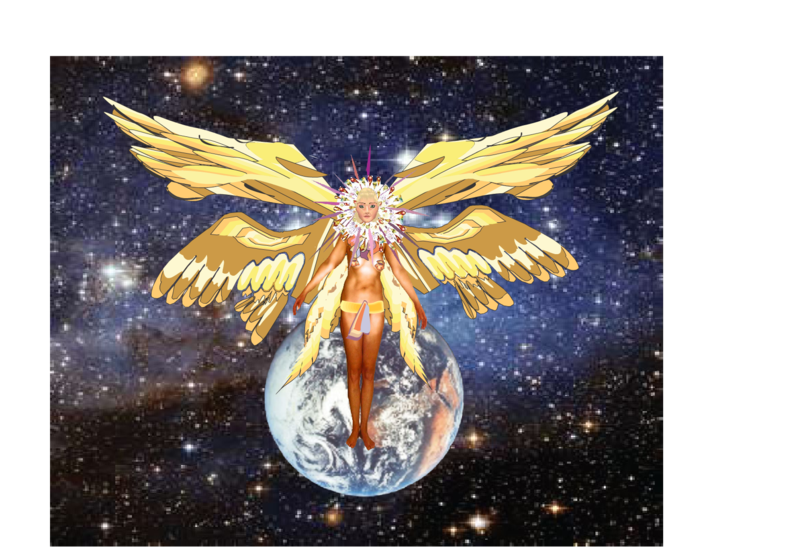 Therefore, whatever degrades and destroys ecosystems is both a biological and a cultural source. 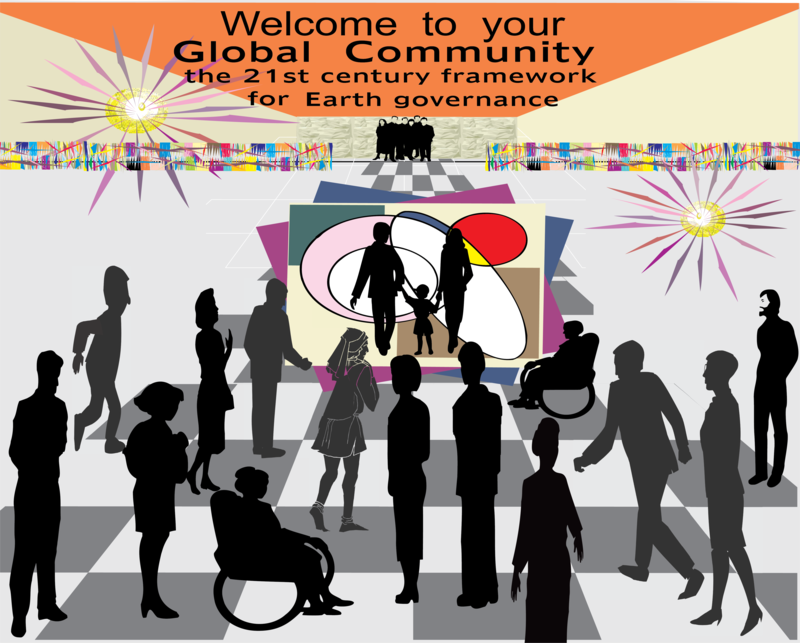 The Global Community values Earth’s diversity in all its forms, the non-human as well as the human. Today the ecological languages of aboriginal people, and the cultural diversity they represent, are as endangered as tropical forest species and for the same reasons: the world is being homogenized, ecosystems are being simplified, diversity is declining, variety is being lost. 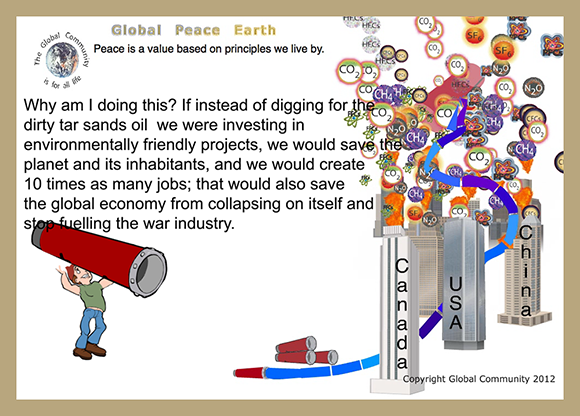 If instead of digging for the dirty tar sands oil we were investing in environmentally friendly projects, we would save the planet and its inhabitants, and we would create 10 times as many jobs; that would also save the global economy from collapsing on itself and stop fuelling the war industry. 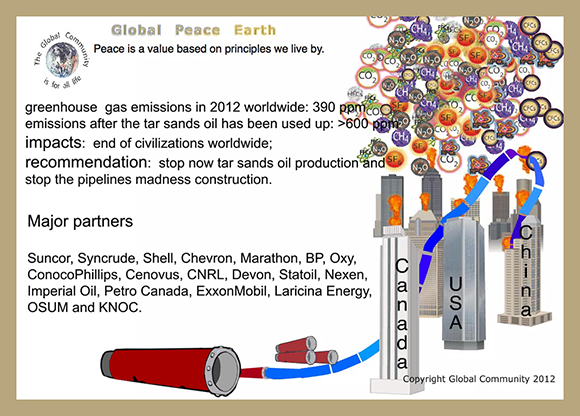 stop now tar sands oil production and stop the pipelines construction. God is with you Eileen, and you are with God. We all love you, and we know you are now in Heaven, God's Heaven, and able to protect us all throughout our lives. Continue being our angel guiding us as you have been for others in your life! 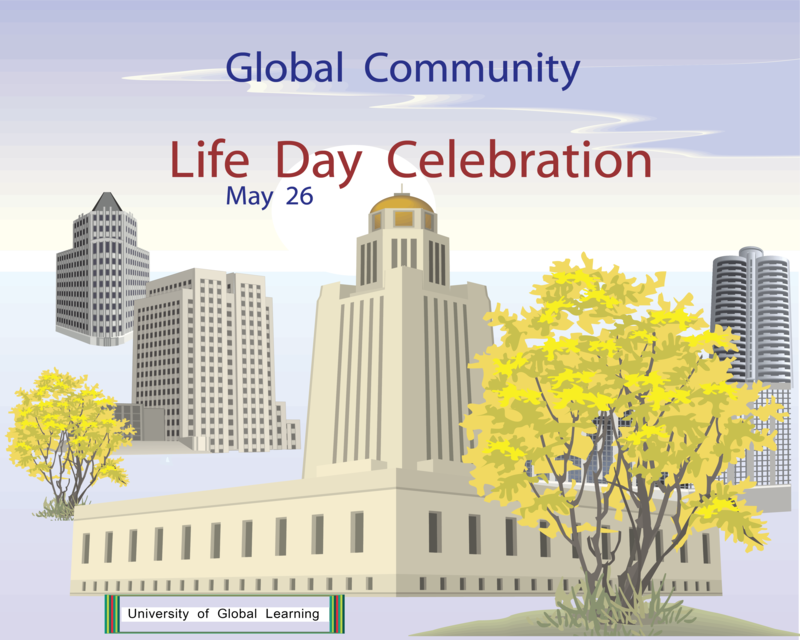 We thank you for all the good you have done! 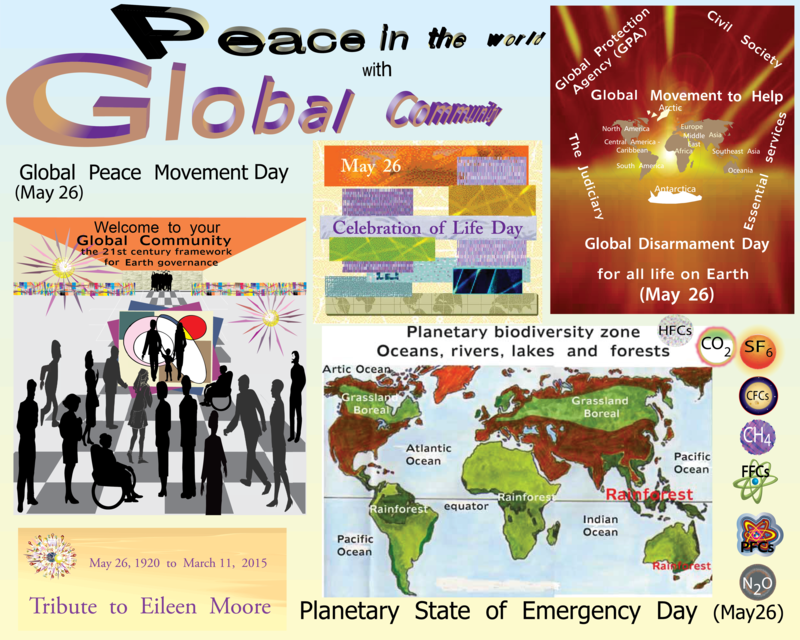 Please hold a moment of silence to remember and honour a dear friend and global citizen, Eileen Moore, who passed away March 11, 2015. 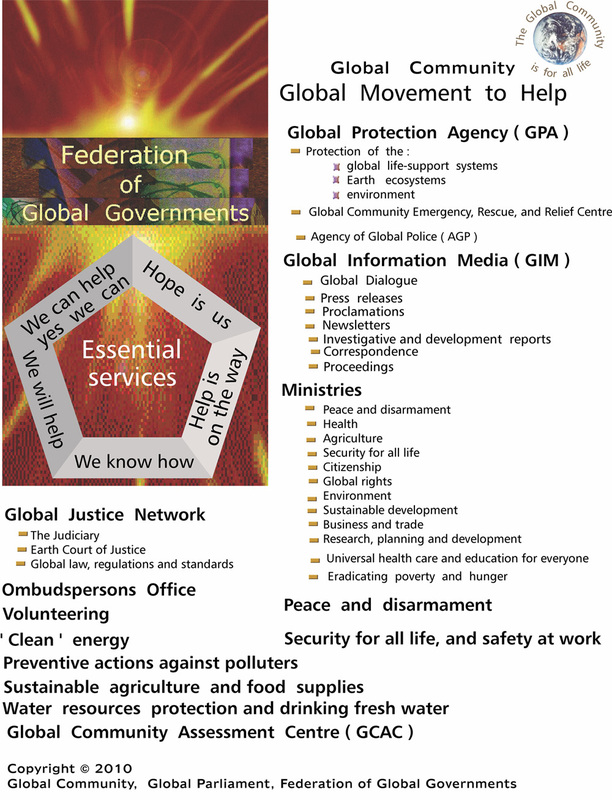 The Global Movement to Help, an initiative of Global Community, is now applying more emphasis on the urgent need from the people of all nations to give everyone essential services. 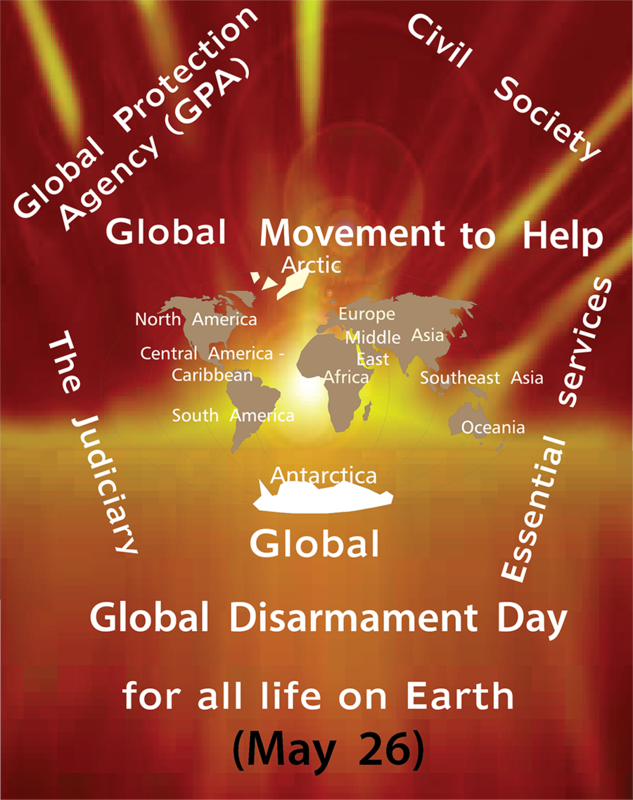 The urgent need to give all Global Citizens essential services was made obvious in the past few years after the occurrence of natural disasters, and the global destruction created by the military. 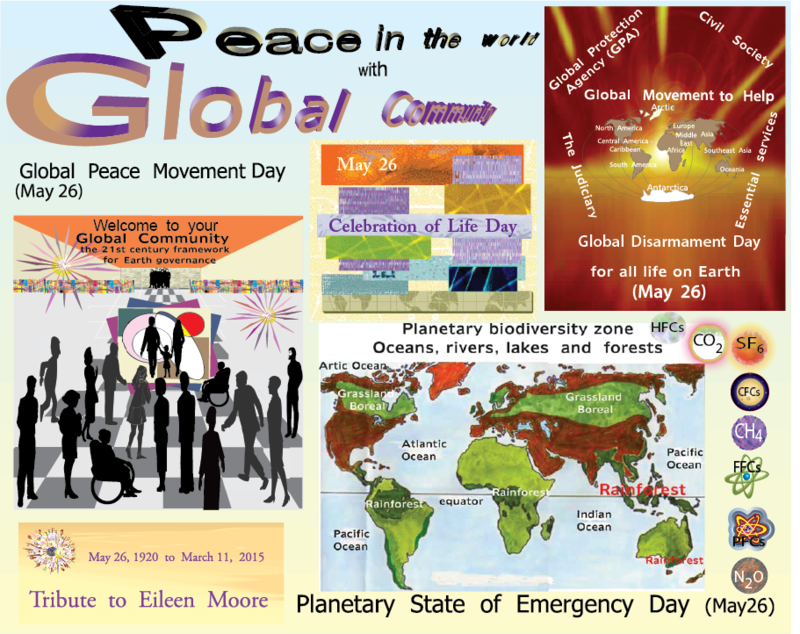 A Planetary State of Emergency Day on May 26 of each year was established to help humanity promote the approval of essential services amongst all nations. To that effect, new global ministries were established to guide us onto the path of global sustainability. Through these new global ministries, each nation takes a larger share of responsibility of the specific region where it operates, and be more accountable to the people of that region. Be compassionate. Essential services to the people of each nation are now the most important global rights on the Scale of Global Rights and are protected by the Global Protection Agency (GPA) of each nation.